/ What Are The Best Stage Pianos For 2019? As a musician, you know very well that for a good performance, besides skill and loads of practice, you need a good instrument. 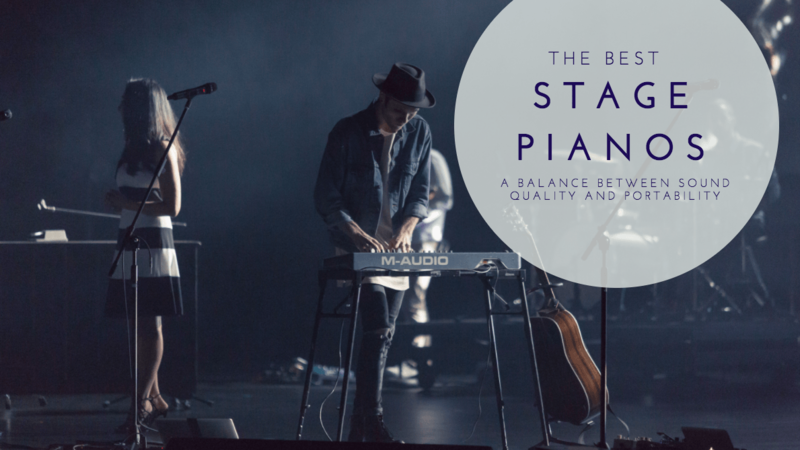 Whether you’re looking for a good stage piano for recording in the studio, or for live performances, there are numerous different brands and models stating that their product is the best one. By reading this article of our pick of the best stage pianos, we hope to give you an insight on the different characteristics you should consider, as well as a great pick of, in our opinion, the best stage pianos out there. If you're not completely set on a stage piano be sure to check out our guide on finding the best digital piano. ** There is plenty more information below, but feel free to check out the Amazon reviews for a second opinion. First of all, you should know what you’re going to use your stage piano for. If your primary use is going to be studio recordings, size isn’t going to matter much. However, if you’re going to tour with your band, keep in mind that smaller, lighter, and more portable models are going to make transporting and setting up a lot easier. Different models emulate the feel of playing a real piano to a different extent. If you’re not a complete beginner, you’ve probably noticed by now the difference between weighted and semi-weighted actions. Higher the quality of this mechanism means that playing it feels more like playing a real piano. If you need the most credible piano feel, look for models which include hammer action, as that enhances the experience the most. As important as keyboard action, when it comes to the feel of the keys, is the touch response. The best stage pianos are capable of detecting slight differences in pressure and velocity, attributing to natural sounding attack and volume of each keystroke. You will have to be ready to invest more money, however, as those models can be quite pricey. As the sound of a digital piano depends on the samples loaded into the memory of the instrument, more memory allows samples of higher quality, thus providing the musician with high-resolution sound, almost identical to a piano. Besides the overall quality of the notes, sustain and decay are also important factors to consider. As polyphony goes, anything between 64 and 128 notes is acceptable, depending on whether you’re using your stage piano for more conventional music or trippy sampling. Besides different piano sounds, most models include samples of different classical instruments, as well as other more basic sounds. Alesis is regarded as one of the best brands when it comes to electronic instruments, as well as studio equipment. The Coda Pro is no exception. A great, and most importantly, affordable stage piano, boasting numerous useful features. The Coda Pro weighs in at around 27 pounds, making it a very portable digital piano to carry around. 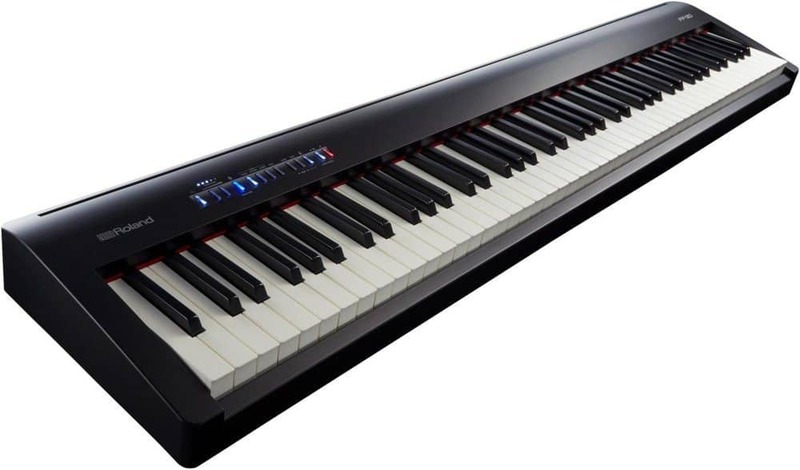 A hammer- action weighted keyboard provides players with a natural feel of playing a real piano. Maximum comfort and playability are also ensured when playing the Coda Pro, as the 88 keys are weighted. Both an aux input and output are included, for connecting a drum machine to the piano, or delivering the piano’s signal to a mixer. When you’re not in the studio and come up with a cool tune, you can even record up to five songs on the go, as the Coda Pro features an onboard memory. A total of 20 different presets are included and considering the 64-note polyphony, more than enough for you to play around with. All in all, a great stage piano to consider buying, especially as it offers a lot of neat features for a relatively low price. Yamaha is already well known in the music industry, so we feel that no special introduction is required. 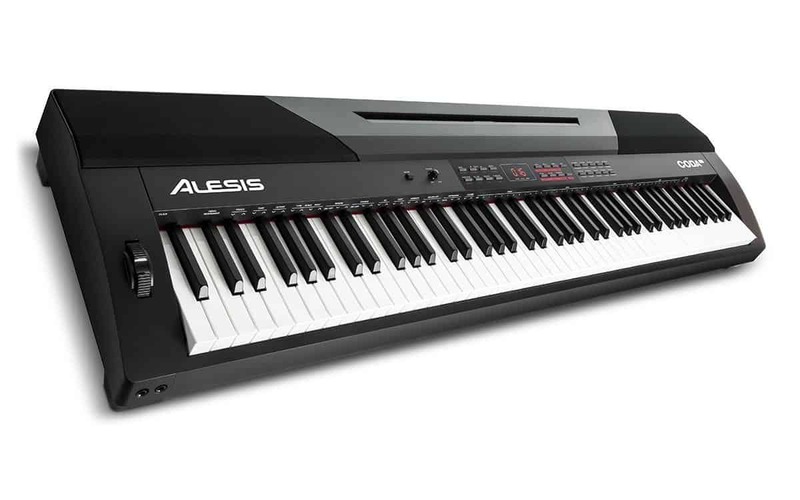 Even lighter than the Alesis Coda Pro, this stage piano won’t be a hassle to move around. Thanks to its graded hammer standard weighted action, the P45B actually feels like a real piano. If you’re transitioning from an upright or a grand piano, you won’t feel a difference. If 10 different voices don't cut the cake for you, you can always connect the P45B to a PC via a USB cable, and use it as a controller. Four types of reverb are also included if you wish to alter the sound even further. 64- Note polyphony is featured as well. Simply put, yet another great stage piano by Yamaha, perfect for both beginners as well as more practiced musicians. Another brand known for its high-quality instruments, Roland delivers just that with its FP-30 stage piano. Weighing in at 44 pounds, it is a bit heavier, but for a good reason. The FP-30 - with those 88 weight hammer action ivory top keys - is a real pleasure to play. Great key action combined with 3 differents modes of playing: Layer, Split, and Duet mode makes this stage piano really stand out. As it supports Bluetooth 4.0 MIDI, you can connect it to a variety of different devices, to record, view sheets, and share your songs. This model also features 128 voice polyphony, as well as 35 different tones to choose from. Certainly, a more high tech approach to stage pianos, the Roland FP-30 is a great choice for most musicians, as it meets all the demands a good stage piano should. Casio’s Privia line is famous for its realistic sound and performance, neatly packaged in high quality and durable models. Lightweight, yet sturdy, the PX160BK is the go to stage piano for touring musicians or music students. Casio went all out with their innovative Tri-Sensor technology, providing a delicate feel and incredible sound, as well as spot-on dynamics and accuracy. It doesn’t get a whole lot more realistic than this. An assortment of 18 different tones and 128-note polyphony sound amazing, both when played through the dual 8W speakers or via the USB cable plugged into a device. High quality is ensured, as the PX160BK is one of the better sounding stage pianos you can get. Described as having amazing finesse and sensitivity while maintaining extremely durable build, the Nord Piano 3 is certainly a choice for professionals. A bit heavier than other pianos we’ve mentioned here, it may not be that portable, but it’s built like a brick house, ready to take a beating. A triple sensor keybed featuring improved grand weighted action allows precise key movement tracking, as well as maximum comfort. The Nord Piano 3 uses a 256MB sample library, as well as a 1GB piano library, which means you won’t run out of samples any time soon. Connectivity is no issue, as this piano features USB connection, as well as MIDI, so it can be used as a controller without a hassle. Definitely a unique experience, the Nord Piano 3 is guaranteed to suit anyone’s needs. Though it may be a bit pricey for some, it’s definitely a good investment. We’ve listed some of the best stage pianos you can buy, great for recording and everyday playing. When it comes to sound and build quality, portability, overall feel, and price, it doesn’t get much better than these models. We hope that we’ve helped with choosing a stage piano that suits you, and wish hours of playing and having fun!